HMF has been offering mezzanine floors for many years, but we also construct office partitioning as part of this service. If you’re looking to create separate rooms in your office – or indeed in a warehouse or retail space, let HMF do the hard work and create a practical yet sturdy office partitioning for your business. At HMF, we create solid walls by using plasterboard that is taped and jointed. This removes the need for partitioning trims and creates a seamlessly smooth appearance. When decorated, this fixed partitioning will blend with your existing walls, making it ideal for boardrooms or meeting rooms. It’s possible to have it fire rated and a range of wall thicknesses are available to fit your requirements for height, fire rating or sound. HMF can provide relocatable office partitioning in thicknesses of 50mm, 75mm or 100mm. It’s available in a variety of finishes and panel configurations and, being fully relocatable, it offers the flexibility to fit in with your working environment. The quality office partitioning system is perfect for adding a stylish finish to your interior space, making your office more flexible in terms of the use of space. The relocatable partitioning has been designed for fast-track installations and you have the option of having it one-hour fire rated, or non-fire rated. For a striking design that offers a degree of privacy to your office, why not opt for glazed partitioning from HMF? Elegant, flush glazed window units can be fitted either single or double glazed. You have the option of integral Venetian blinds to provide greater privacy and a higher level of sound performance. Both full height and half height glazing is available and you can have the glazed partitioning with 30 minute or one hour fire resistance if needed. 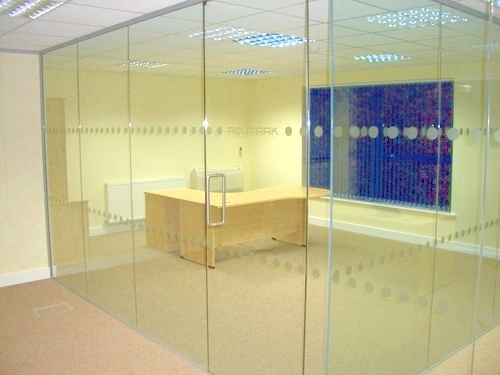 When you choose to have a glazed partitioning system for your office, you will need to fit manifestations. These are part of the statutory requirements within Building Regulations Document M, but you can have manifestations that fit with your corporate identity. Your company logo or a generic pattern can be used, offering greater privacy to individual offices and enhancing internal branding, all with the use of manifestations. If your workspace has high ceilings or is a high risk area, you may want to consider jumbo stud partitioning. It is ideal for greater heights and better fire and sound insulation performance as well. These partitioning boards can be finished with tape and jointing, giving a seamless finish. Painted aluminium trims can also be used as an alternative, but it depends on your business as to which is more suitable. 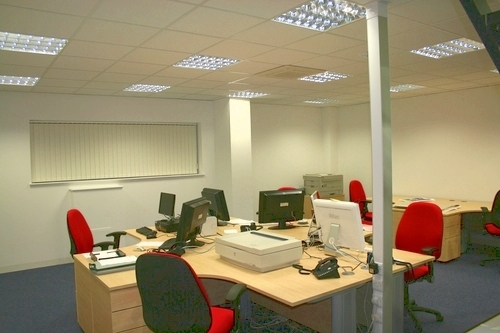 If you’re looking for reliable office partitioning in Surrey, then look no further than HMF. We have been offering partitioning for many years and have several case studies to show for our work. Please have a look at our gallery for previous work examples or contact us to get a quote for office partitioning in Surrey.